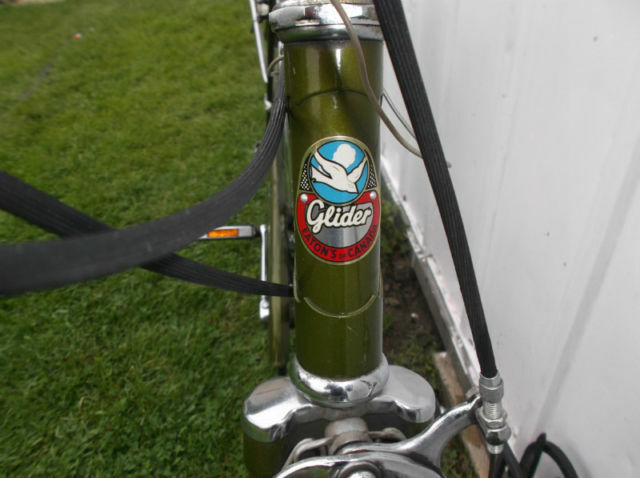 An early 70’s Eaton’s Glider 3 speed offered at $150.00 including delivery. The Eaton Family mausoleum in Mount Pleasant Cemetery. Sadly, this one was stolen a few days after completion.. I couldn’t let this one go with mis-matched tires, plus it needed some refinements as well. I didn’t want to spend any more money on it but still wanted it looking presentable. New tires were purchased for a couple of my regular bikes and the discards (still good) made their way onto the Brown Bike. I also added a pair of shortened inverted bars, a newer brake lever and new pads. I took it out for a couple of hours today for a shakedown and it’s quite a nice riding bicycle. 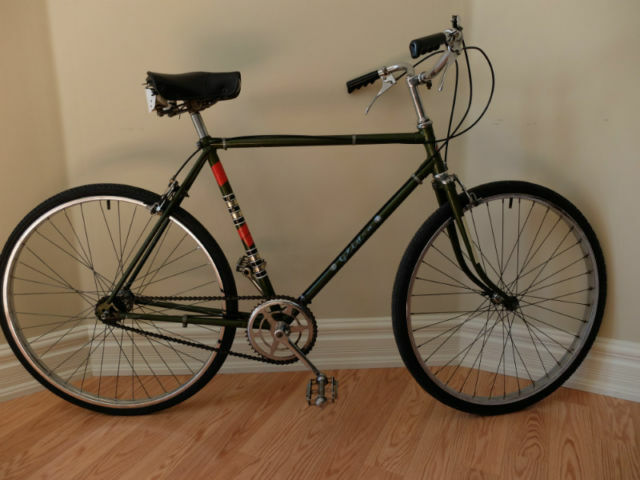 Another 3 speed Eatons Glider on Kijiji, Toronto. Appears to be in good shape with the seller asking for a best offer. 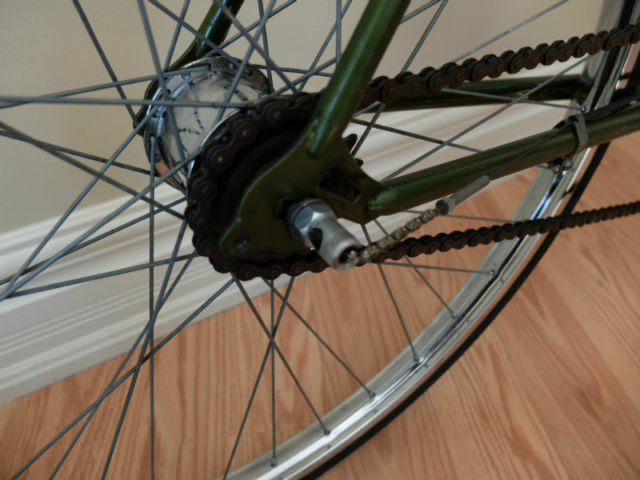 The rear wheel has a 1968 Sturmey Archer Coaster hub and there’s a single caliper on the front. Everything else was either on the frame or came from pieces in the shed. Frame also came with a nice period kickstand which will migrate over to one of my bikes in need. This will either go to a former student (at cost) or be a loaner for a friend who’s coming to visit. 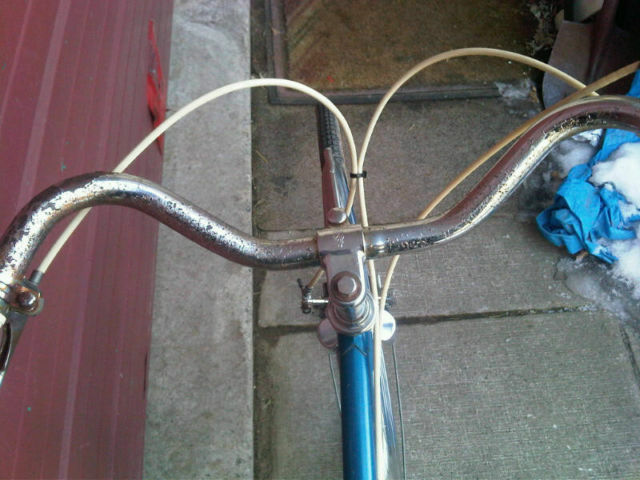 Reasonably priced at $160.00, this bike is currently for sale on Kijiji Toronto. A Bitsa is a British term for something (usually a motorbike) that’s made from bits of this and bits of that…. I had said I would tidy up a bike for a young woman that I work with. She picked up a CCM 3 Speed from me last week and wanted to give her old bike to her mother. It turned out to be an odd Swedish bike, a Crescent. 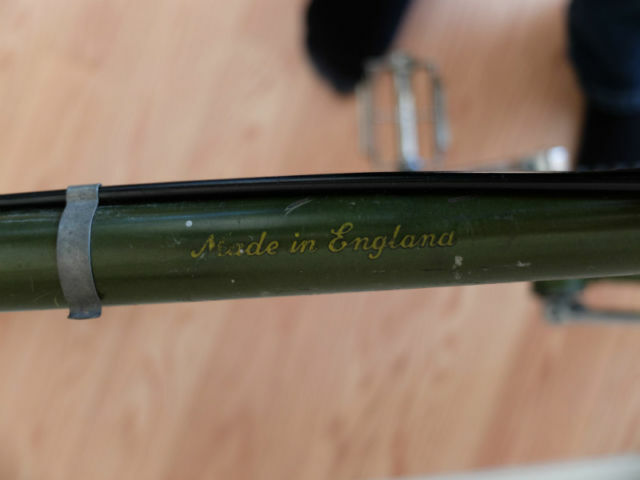 I ended up getting the bike about 80% back together before I realized that the frame was badly bent…..
A quick visit to George at Parts Unknown produced a very nice Ladies Norman bicycle circa 1960 (pre Raleigh). 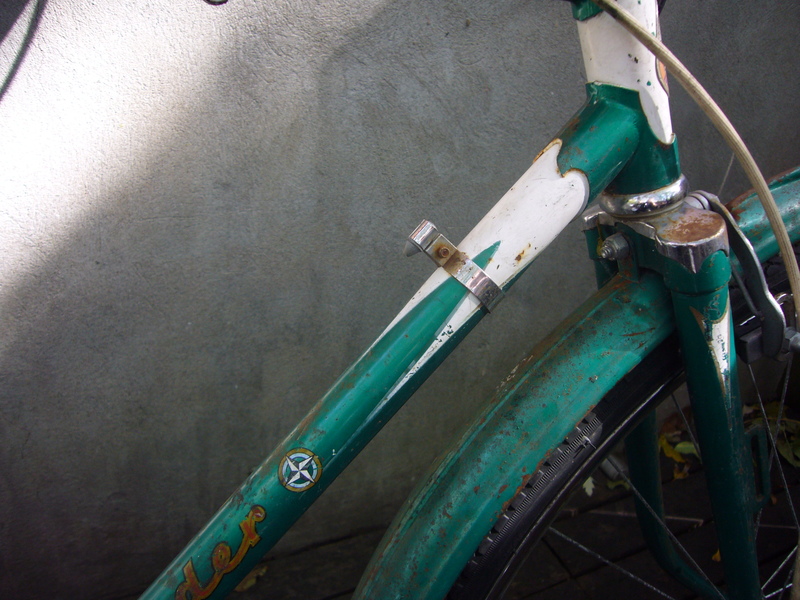 Anything useable was salvaged from the original bike and transfered, including the aluminum rims, stem and bars, basket, etc. I was able to salvage some useful 3 Speed parts from the Norman and transfer to some other projects. 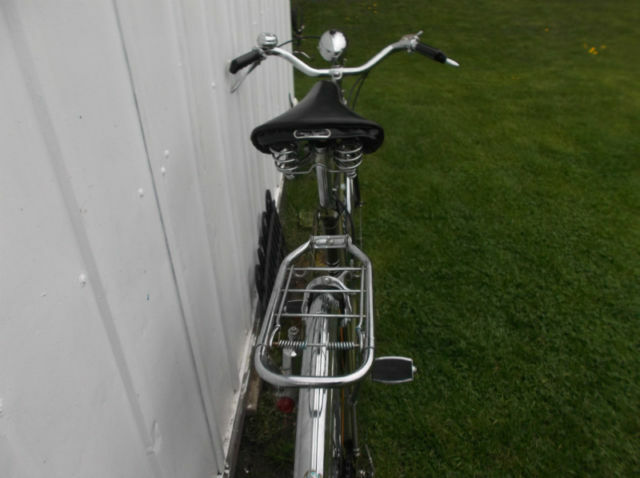 The bike is currently set up with a coaster brake back wheel and a single front caliper. The chain guard is from an Eatons Glider. This bike showed up on Kijiji this morning. A 1975 Eatons Glider 6 speed, hand built in the Carlton Workshop. A catalogue page for the 1974 Carlton line. Not sure why there’s a guy in a dirty smock loading a shotgun…. This example recently sold in England for $600.00. 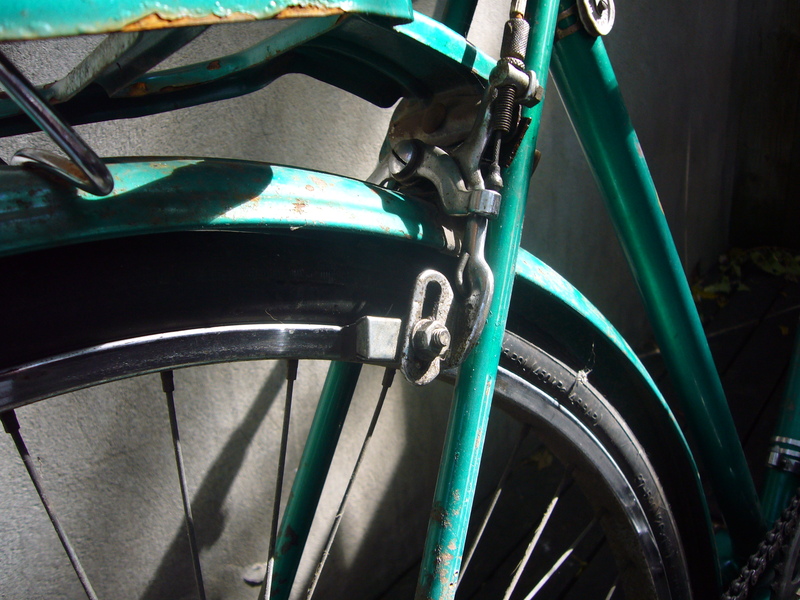 Although Carlton was part of the Raleigh family their bicycles were still hand made for the most part. This one’s currently on Craigslist, Toronto. 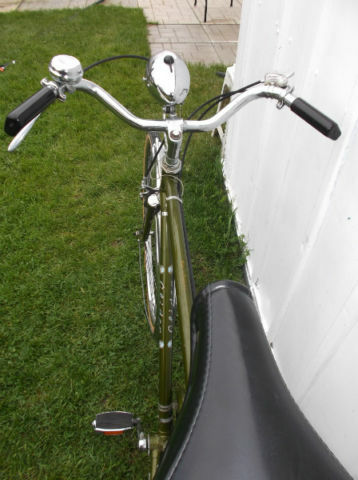 A mid 60’s Raleigh built Glider for Eatons Canada. Obviously needs some work but could be a good basis for a project. Owner is asking $150.00. I’ve probably finished up with this one for the time being. I should point out that the bike as purchased was a fairly complete 3 speed so some of those parts have been repurposed or stored. Despite the fact that I had just told myself “no more bikes”, this one appeared on my neighbour’s lawn yesterday with a for sale sign. I paid full price, $40.00! It had several nice parts on it that have already been harvested and installed on my 1960 Norman. This bike even has these rare pump brackets attached which will find their way onto another bike. The hub on this one shifts well and the rims are in decent shape. More to follow. Work has started. Bike has been disassembled and all bearings cleaned and re-packed. There’s a small threaded lug behind the chain ring for attaching a full chain case. 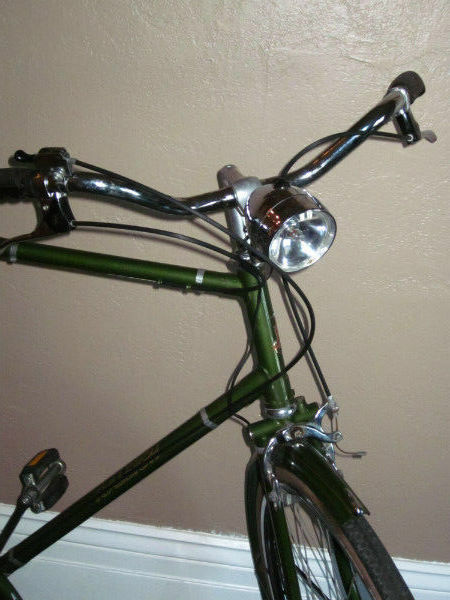 There’s also a bracket on the front fork for a light. It makes me think that this frame was originally intended for something other than a Department Store Bike…. 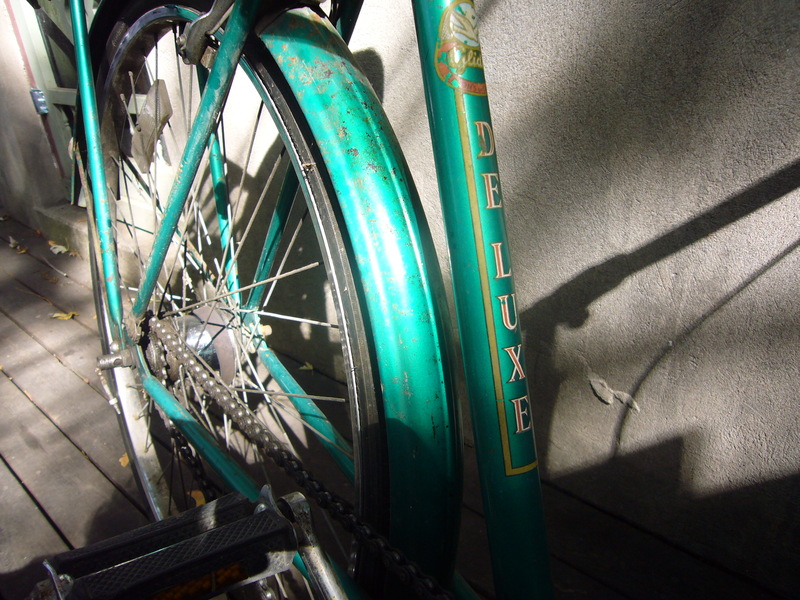 Below, a Raleigh Sports version of the same bike. Not a 3 speed but worthy of a mention. A nice clean. original bike at a reasonable price. 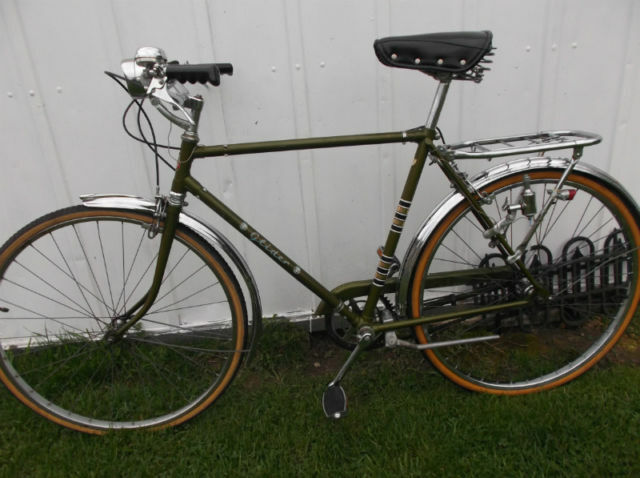 Vintage 1972 Raleigh Carlton Glider 10-speed road bike. 21.5-inch fully lugged and brazed frame made of TI-Raleigh proprietary 2030 high tensile tubing. 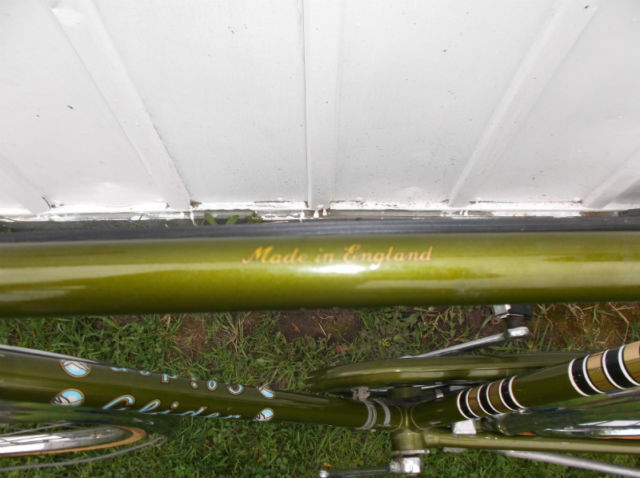 Frame set made by Carlton in Worksop , England and bike assembled for Eatons by Raleigh in Nottingham. Chromed forks. 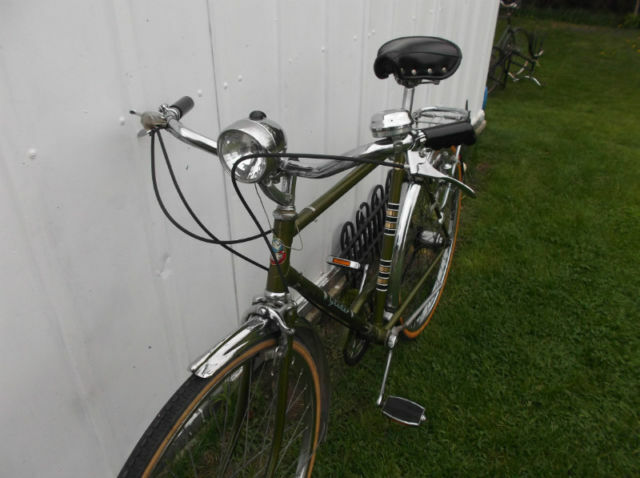 Sold by Eatons of Canada as a Raleigh “Truline Glider”. Should fit a rider from 5’4″ to 5’9″ approx. 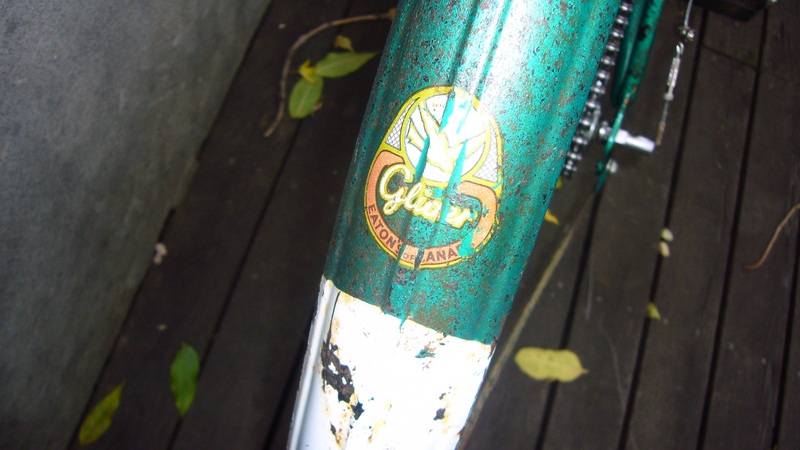 Most Eatons Gliders were single speed, 3-speed or 5-speed cruisers. This is one of the higher-end 10-speed racing models with Carlton frame and French and English drive parts. Hey Hipster! 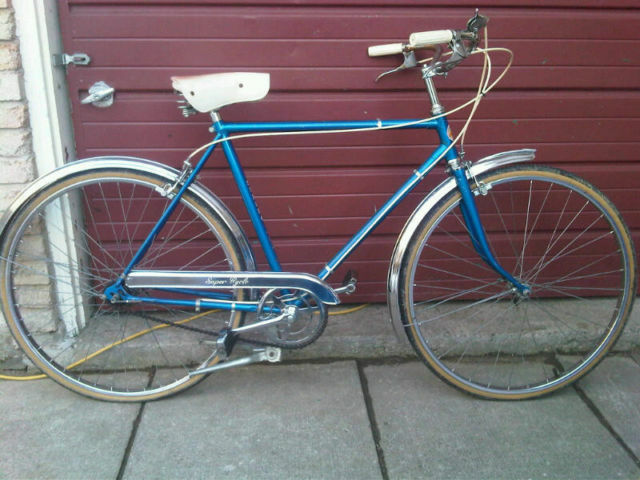 Raleigh Glider for Sale! 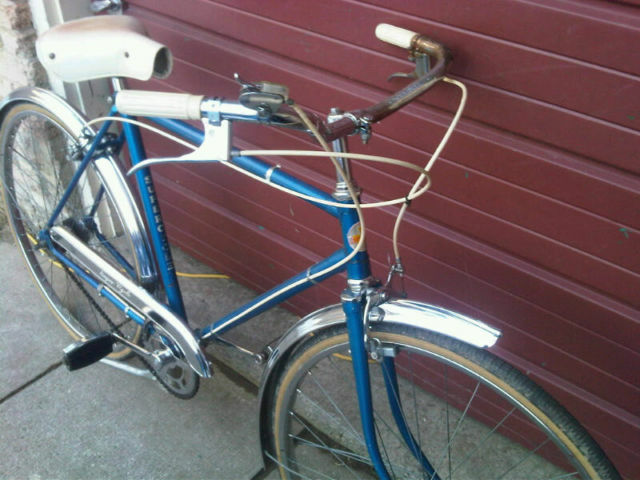 This is the banner that appeared on Kijiji for this Raleigh built 3 speed Glider offered @ $135.00. 3 speeds are now hip! This is the 500th post on Three Speed Mania!! These two 3 speeds showed up on Kijiji Toronto today. 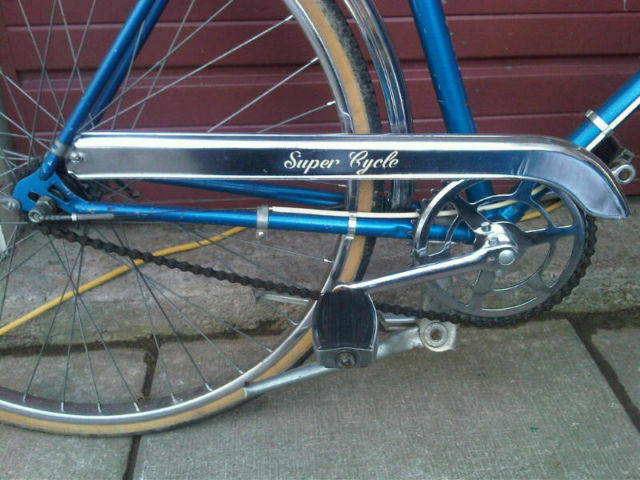 First, a British made Supercycle offered at $135.00. The second is an Eaton’s Glider @ $95.00. 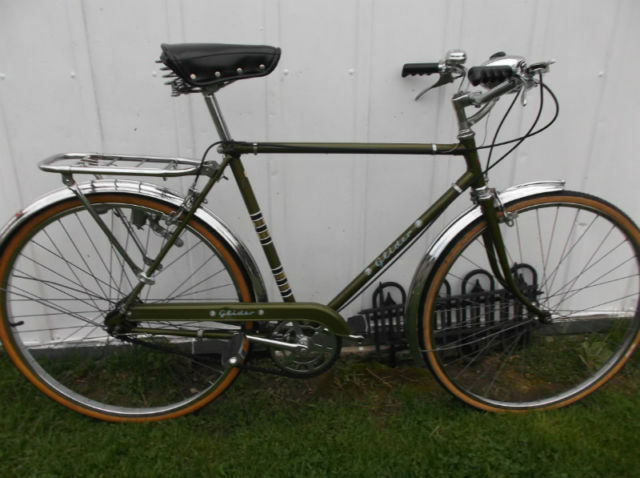 This one appears very clean and original (except missing fenders) and very good value for the price. 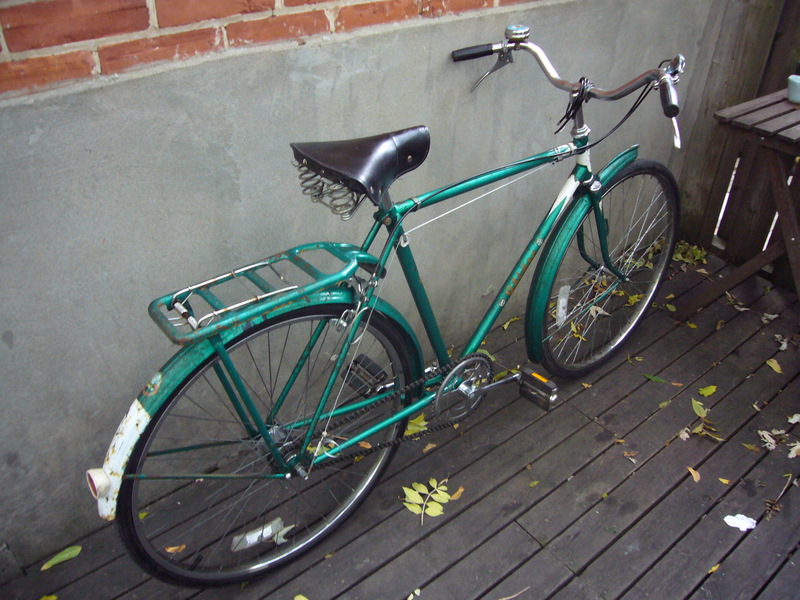 Bike is located in the Toronto area. Monkey Bike? Banana Bike? Chopper Bike? $59.99 was a LOT of money back in 1969! 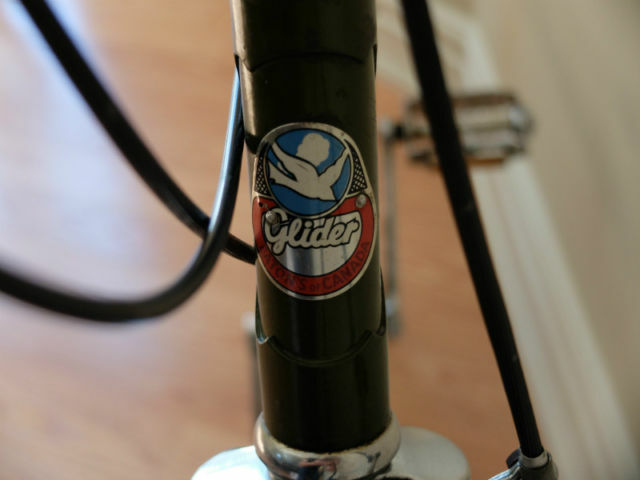 A viewer has sent me some photos of a pair of his and hers Raleigh built Gliders that were recently purchased. Last post on this one until spring. 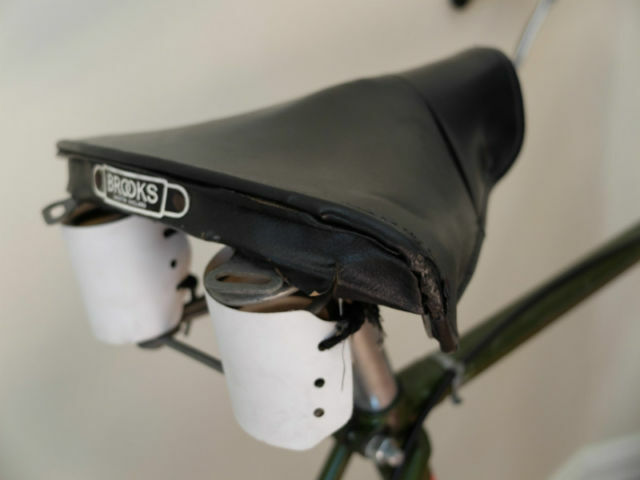 I found and old Speedic leather saddle and managed to restore it somewhat with liberal doses of Proofide from Brooks. A pair of old Raleigh black rubber grips replaced the original red plastic ones. A 22 tooth cog on the rear hub. Last Sunday’s shakedown ride proved to be a bit of a disaster. I had to stop en route to buy some wrenches to tighten various bolts (I needed a new set anyway and they were on sale). Then the NOS brake cables I’d put on started to bind really badly. I think the ferrules were too small and were getting twisted in their housing. Finally I locked the bike up outside the El Mocambo to see some (work related) wrestling and when I came out some Jackass had locked his bike to mine!!! I killed some time in Kensington but when I returned it was still locked so I removed the Brooks saddle and the hand pump and took the streetcar home. 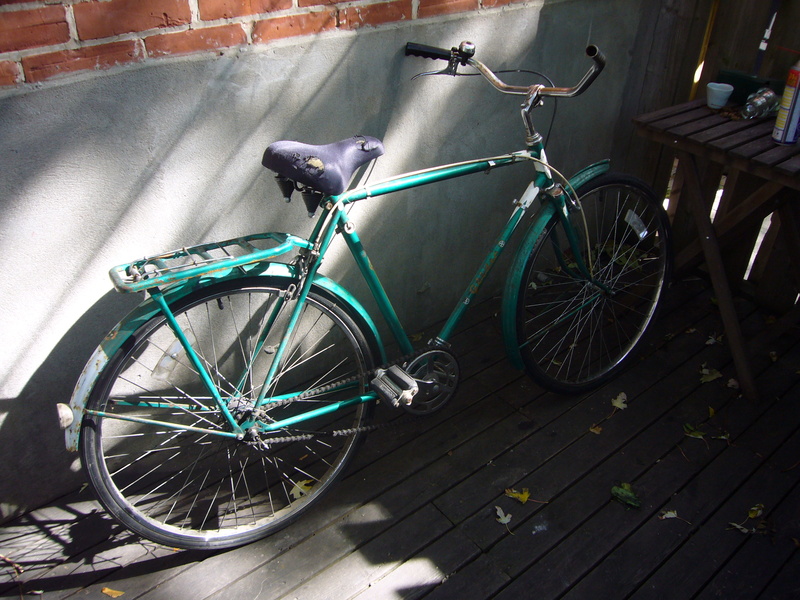 In any case, I got the bike back the next day and replaced the brake cables with some refurbished Sturmey Archer originals I had in the garage. I’m still on the lookout for a mini fender (or fenderette) for the front wheel. Today’s ride was a success and it’s one of the cleanest shifting hubs I’ve had. Even though I like the look of the inverted handle bars, I find them uncomfortable. I’ll probably flip them back to their normal position. 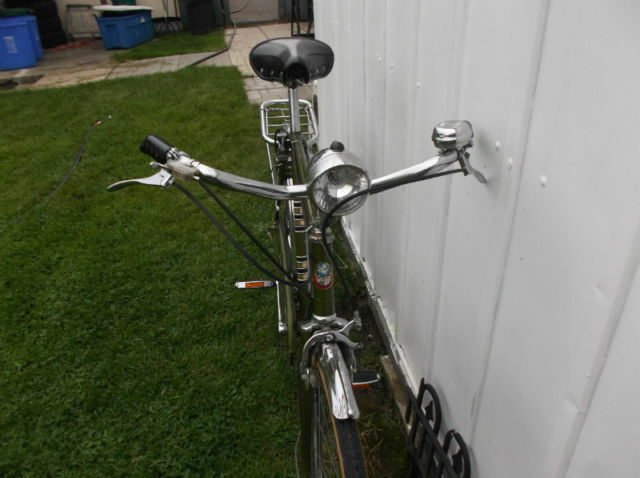 Here are some before photos of the bike that was purchased in Dundas Ontario last week. I had a very productive day gathering supplies and parts for this current project. After a thorough cleaning I started to re assemble. A few new spokes on the back wheel, the bottom bracket got new bearings and was repacked as well as the stem bearings. I re-used the original tubes but already had some new tires in the shed. I find that old inner tubes hold the pressure better than modern ones. Mini fender supplied by George (the bike shop at the foot of Fraser). Also had an old style thumb shifter in the garage. New vintage style pedals from Martin at Hoop Driver Bicycles on College. All new cables and a new chain. 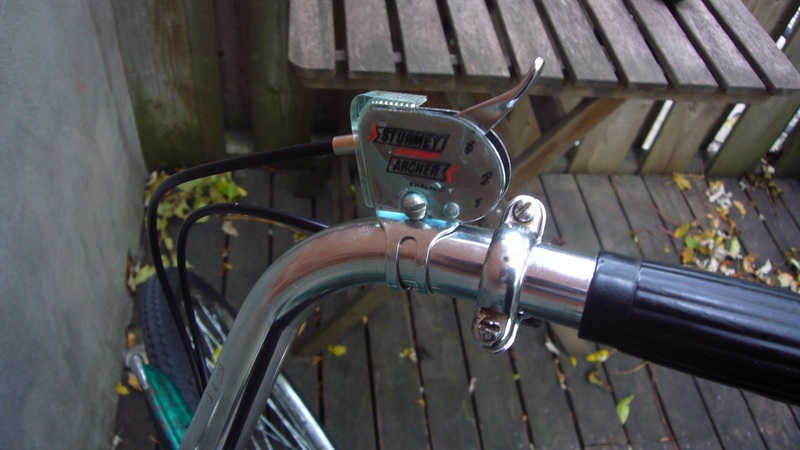 I like the old style 3 speed cable system with the carrier wheel at the back. I’m just missing the little hard plastic “stop” that holds the cable housing. I’ve made a temporary one out of a rubber grommet and a brake ferrule but will look for the proper piece today. Cables/tires/pads and saddle I already had on hand. Time to put together: Priceless! 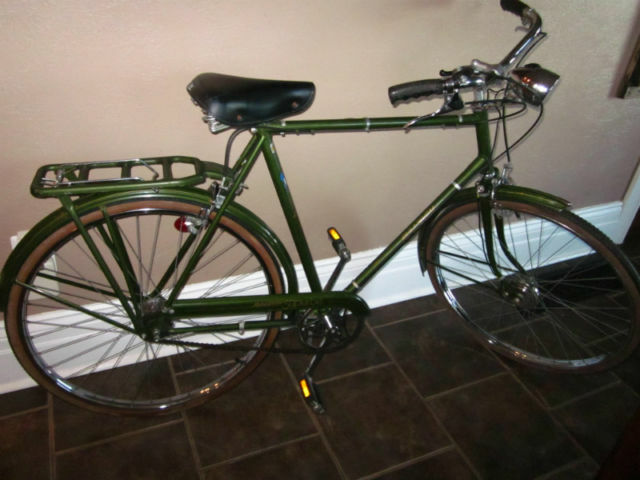 A picked up another little project this week, a 1964 Eaton’s Glider 3 speed (made by Raleigh). More to follow as the bike progresses. The bike’s been stripped down (the easy part) and I quite like the frame. Time to work on the bottom bracket and start to clean and re assemble. 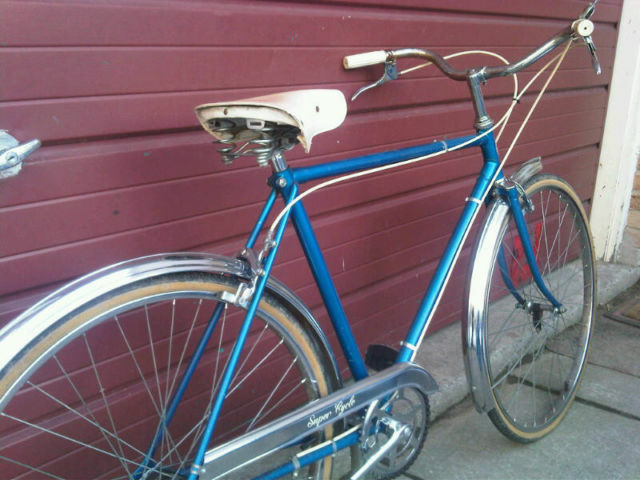 Another Raleigh built Eatons Glider 3 Speed for sale last week on Kijiji Toronto. From the pedals it looks like it’s from the early to mid 70’s. I can’t remember the asking price but recall it being quite reasonable. This one has an aftermarket trigger that I’ve never seen before. An English built Eatons Glider. Here’s a nice shiny example of a Raleigh built Glider for the Eatons Department store chain. It can be found on Kijiji Toronto.